Peyote Stitch is a versatile beading technique. You can create shapes and patterns that will result in wonderful designs of beaded jewelry with Peyote Stitch. Here is a basic pattern for a petal created by Assza Beading Arts using Peyote Stitch. Use the following seed beads so you can follow the steps. 1. Pick up 5pcs Green, 7pcs Ecru and 4pcs Silver. Skip the last 3pcs seed beads and go back to the first silver bead. 2. Repeat Peyote stitch, picking up 1 bead and skipping a bead. Repeat 4 times with Ecru and then 2 times with Green. 4. Repeat 4 times with Ecru then once with White and then go back to the last White you just added. 6. Do Peyote with each seed bead in the following order: Ecru, Silver and White and then go back through the last White you just added. 7. Do Peyote with Silver 2 times and then go back to the last Silver you just added. 8. Do Peyote with 1 Silver and the go through the next 7 seed beads and then come out at the very bottom bead of your beadwork. 9 -14. Now, repeat steps 1-8 for the other side. 15. Let’s start to embellish your petal. Weave your way up to the side of the beadwork. Pick up 2 Silver, 8 Blue then 1 Silver and go through and back up the Silver on the ear-top. Then pass through the 2 seed beads you just added. Pick up 6 Blue and 1 Silver and go through and back up the Silver ear-side and the 2 see beads you just added. Continue adding the blue edge of the petal. Repeat in this manner of weaving with 10 Blue and 1 Silver, then 6 Blue and 1 Silver and lastly, 7 Blue and 2 Silver. 16. For the final embellishments, weave your up to the bead as shown in the diagram. Pick up 2 Green and 3 White and go through and back up the signed Ecru and pass back through beads you just added. Pick up 2 Green and 4 White then go through the signed 2 Ecru and pass back through the beads you just added. Pick up 2 Green and 3 White then go through the signed Ecru and pass back through the beads you just added. Now, you can secure your thread. Now that you’re done with your Peyote Stitch petal, you can create as many as you can and arrange them how you wish. 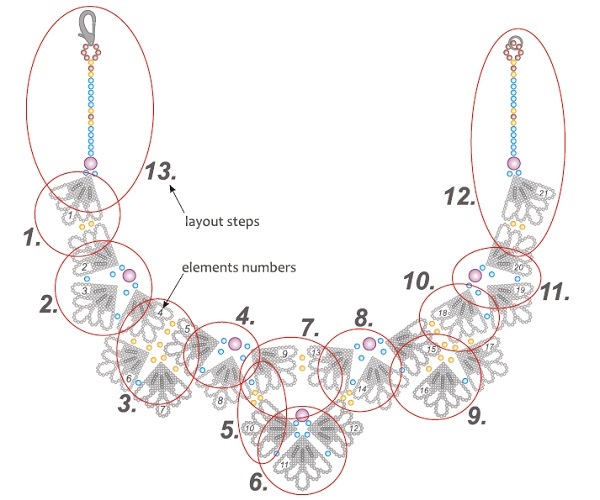 But here is an example of how Assza Beading Arts arranged her Peyote Stitch petals and turned them into a necklace. Create your own Blue Petal Necklace. Follow the complete tutorial with written instructions and clear images.